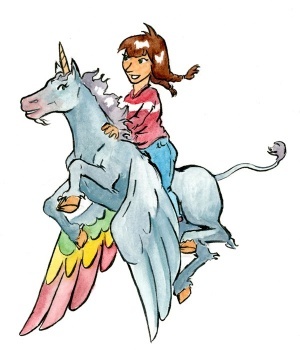 For a mere $25.00, artist Jen Vaughn will paint a portrait of the person of your choice riding a unicorn. The season of giving is upon us, and I don't know about you, but I had no idea what to get anyone. Thanks to the internet, my problem is solved, and all my friends and family will be receiving portraits of themselves riding unicorns. Artist Jen Vaughn, who also goes by "InkyJen," is offering these personalized works of art on Etsy, and will ship them all over the world. Holiday shopping = done. The listing is pretty self-explanatory, but for those requiring further information, Vaughn specifies the painting consists of "some magic black ink, watercolor and white bristol! After your purchase, please send me a few photos of the person you wish to see riding a unicorn. I'd suggest a few close ups on the face and one full-length!" The example image shows a winged unicorn, and Vaughn acknowledges this, offering to add wings to the package if people are nice about it. If unicorns aren't your thing, Vaughn also offers to draw a loved one as a mermaid for even less: $15 for a black and white portrait, $20 for the full color experience. Mermaids seem to be Vaughn's thing, at least: When she isn't sticking folks on unicorns, she writes and draws a webcomic called Mermaid Hostel.